From IndiaBrand: UnbrandedSiteWideCondition: NewWidth: 45"
Satin Fabric Floral Print Green 3 Yards Formal Clothing Sewing 44"
A lovely blue satin; machine wash & dry. improve our performance. Price is per one-half yard, (18" long by 43" wide.). txzj pxzj35883 txzj67. Material :satin,slightly stretch. 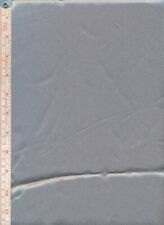 Product :Spandex Fabric. Composition :98% polyester 2% spandex. Material :Polyester / Lycral. Pattern :Print. Brand: UnbrandedColor: GoldWidth: Less than 45"
Satin Fabric Floral Print Pink Formal Clothing Crafts 3 Yards 44"
The bridal satin is a luxurious 60" wide, 100% polyester satin fabric. Known for its silky smooth touch and radiant colors, this high quality satin is ideal for -blouses and many other forms of apparel! The bridal satin is a luxurious 60" wide, 100% polyester satin fabric. Known for its silky smooth touch and radiant colors, this high quality satin is ideal for -bridal wear. -blouses and many other forms of apparel! Design: Rose floral on an off white background. Lovely quality. 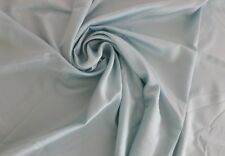 Aqua ShinySATIN Fabric Soft Slinky with Selvedge feels like rayon or polyester. Color: subdued Aqua. A wide selection of CLOTHES, ACCESSORIES, TOYS, JEWELRY & MORE including Fabric at GREAT PRICES! I list frequently! 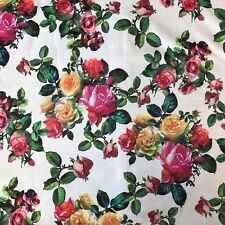 3 Yards Satin Fabric Floral Print Orange Color Formal Clothing 44"
This is a large piece of satin fabric that is white and shiny. It has a beautiful sheen to it and has a gorgeous warm color! This is a large piece of satin fabric that is a maroon/burgundy shiny color. It has a beautiful sheen to it and has a gorgeous rich color! Satin Fabric Polka Dot Print Blue 4 Yards Formal Clothing 44"
Black with small white, green and bordeaux floral. 3 yds 5" x 58W. Red/Black inch Stripe Soft/silky Chartreuse Satin Fabric. (20 Yards). Design: Rose floral on a dark navy background. 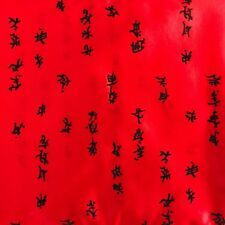 Colours may vary slightly to those depicted in photo's - the background of this fabric is dark navy not black. The bridal satin is a luxurious 60" wide, 100% polyester satin fabric. Known for its silky smooth touch and radiant colors, this high quality satin is ideal for -bridal wear. -cocktail dresses. -blouses and many other forms of apparel! The bridal satin is a luxurious 60" wide, 100% polyester satin fabric. Known for its silky smooth touch and radiant colors, this high quality satin is ideal for -bridal wear. -cocktail dresses. -bridesmaid dress. Single length of Blue Background Love Heart and Teddy Bear Print Polyester Satin Dress Sew Craft Fabric. 100cm long x 114cm wide. Bank deposit is no longer available. Colouring & general appearance may differ from computer or device screen.